Marketing executives and consumer advocates alike predict a future of brand-proof consumers, armed with technology and a sophisticated understanding of marketing techniques, who can effectively tune out ad campaigns. But as Rob Walker demonstrates, this widely accepted misconception has eclipsed the real changes in the way modern consumers relate to their brands of choice. Combine this with marketers' new ability to blur the line between advertising, entertainment, and public space, and you have dramatically altered the relationship between consumer and consumed. That is I had to force my self to listen right up to the end. It definintely does give you good info, you should know about. It does help to know what you are buying into in this world and defintely helped my on my self improvement quest. 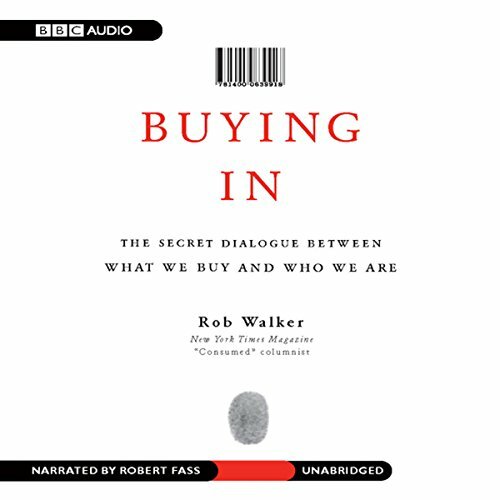 Buying in was, for me, an interesting and thought provoking book. Marketing is a key component of my job and Rob Walkers book gave me some valuable insight as to how the consumer views it (marketing). I found it valuable in that it sparked multiple and new avenues for me to market my business. I would caution though, the book is not a how to market to the new consumer. What it is, is new way of looking at and thinking about marketing. This book focuses on what the author calls "murketing", which is where marketing blends into real life. Examples include the way people are invited to become "product advocates" (my term not his) to promote products for corporations, and how brands have become a part of self-identification. Walker is a journalist and it shows from his writing which is clear and not overwrought or stilted. I found the book to be interesting, although the author was a bit too enamored of the new. Everyone who writes one of these books talks about how the world is changing and has never been this way before. Walker isn't quite that gullible and he even points to the past sometimes, but I found still that he seems to believe that his insights are unique a bit too often. They're not, but that doesn't make the book less worthwhile and it doesn't mean you shouldn't consider it. Often Audible narrators are annoying and can't pronounce non-English words properly, emphasize the wrong syllables, etc. You won't have that problem here. Fun book from the NYTime's Magazine Consumed column...delves into the world of "murketing" - the new method of connecting with consumers who are immune to traditional mass marketing. Some interesting connections on how we could "market" educational technology. Finally, a book on Marketing that goes beyond corporate clich? and frivolous research. Excellent insights, excellent narration. I think I'm a slightly more informed consumer after reading this book. I finally know the history of Hello Kitty! Just a heads up if you ever find yourself being interviewed by the author -- if you use the F-word you are practically guaranteed to get quoted in his next book.